Hillfield Village nestles in a pretty sheltered valley, close to the historic naval town of Dartmouth, renowned for its scenic situation at the mouth of the River Dart. This picturesque port, famous for its long-established seafaring connections, is the perfect year-round destination. Offering numerous festivals, events and activities. It even has its own microclimate. This adds to the lifestyle appeal of the area and hasn’t gone unnoticed by astute property buyers. Purchasers are inspired by Hillfield Village as it offers a great diversity of product, plus an attractive live /work life balance. A select number of bespoke homes are now available to purchase as main residences, holiday homes or rental properties. 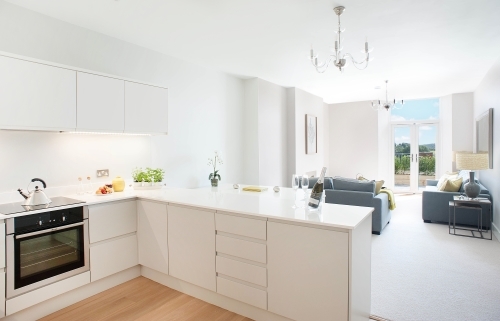 Hillfield offers a charming range of properties. 1 The Drive is an exceptional architect designed newly built detached house, finished to an inspiring specification. A feature being the mono string staircase with solid wood treads raising to the first floor, asking price £745,000. 5 The Manor House, is an elegant two bedroom first floor apartment recently refurbished with sweeping countryside views and parking, asking price £275,000. For further information on the opportunities at Hillfield Village and the on-site leisure facilities, please contact Marchand Petit’s Dartmouth office on 01803 839190, email dartmouth@marchandpetit.co.uk.